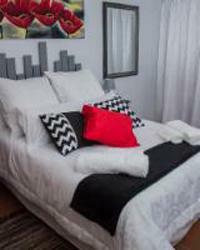 Oppi Hoek Guest House offers a home away from home in our stylish and affordable bed and breakfast en-suite guest rooms. We have five double rooms and one single room. The rooms include an area information booklet, a fridge, bathroom towels, bed linen, complimentary toiletries, fans, Wi-Fi, satellite TV and a fully equipped kitchen. The conveniently situated suburb of Riviera lies virtually behind the famous Union Buildings, to the north of Pretoria. The broad jacaranda-lined streets in Riviera and comfortable homes with their manicured gardens are little different from other suburbs in the city, but you’re centrally placed and getting around is easy, particularly as you’re only 10 minutes from the centre of the city. Stay between 05 Apr 2019 and 30 Apr 2019 and get 25% off. Stay between 05 Apr 2019 and 30 Apr 2019 and get 20% off. Room is very comfortable, free unlimited wifi is a big plus....rooms were cleaned everyday. They allowed me to keep my bags when I checked out which was a big plus. It is located in very safe location as there are many varsities. Oppi Hoek was very accommodating when we ran into trouble trying to book a guesthouse at the last minute. This family-run establishment has an incredibly helpful and kind staff. Thank you for the wonderful stay! I enjoyed the service i got the people were so friendly i will surely come again.. Upon arrival we were received by Erika. What a surprise, most accommodating and most friendly host ever. Lovely rooms, all was nice and clean. Had such a pleasurable stay. Will recommend them on any given day. The rest of the staff we met during breakfast was just as friendly. They have a winning recipe with an awesome team!! Oppi Hoek Guesthouse is 2.8km from the centre of Pretoria (Tshwane) , the nearest airport 10.3km (Waterkloof AFB Airport).